On July 1, 1863, two armies with distinctly different visions - one, of freedom for all; the other, of freedom for some - square off at Gettysburg, Pennsylvania. Three days of fierce fighting transform the quiet wheat fields of this tiny farming town into a mass graveyard for over 50,000 soldiers. 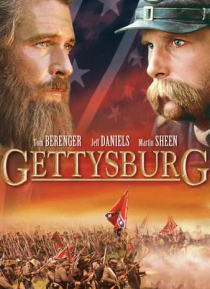 Filmed on location at the actual battlefield, this monumental production captures on a grand scale th… e legendary battle of Gettysburg.